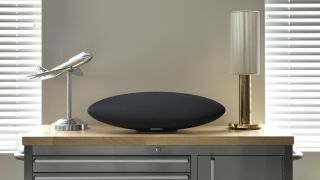 Bowers and Wilkins has today released the new Zeppelin Wireless, a brand new spin of the iconic design which redefined the audio docks of the iPod era. Eight years on from the original Zeppelin, the new Zeppelin Wireless has been redesigned from the ground up. "This is completely new," explained Graeme Taylor, Head of Marketing at Bowers and Wilkins. "I asked the engineers if we could say it's 100% new and they were saying 'well, not really, we've used the same screws in the base and some of the same wires…' but it is." That's an indication of how obsessive the B&W engineers have been with reimagining one of its most distinctive designs. However, that ellipse shape remains and it's acoustically functional as well as supremely funky. Critically, it now supports both Bluetooth as well as Spotify Connect, backing up the existing AirPlay functionality to open the powerful speaker up to everyone. With a pair of 25mm tweeters at the very edge of the ellipse and the same Fixed Suspension Transducer tech as used in the beefy new 800 Series' loudspeakers, in 90mm trim, the Zeppelin Wireless is able to power some incredibly detailed audio at both high and low volumes. The new Digital Signal Processor (DSP) is twice as powerful as the original Zeppelin's, and all inputs are up-sampled through the audiophile-level 192kHz/24bit DAC. That makes the new Zeppelin a seriously impressive speaker. With the release of the newly designed, mammoth 800 Series loudspeakers last month and now the new Zeppelin Wireless, it's been a big year for the British audio company, just ahead of its 50th anniversary in 2016. And the same obsessive engineers who have created the studio-quality 800 Series speakers have been the ones creating the new Zeppelin Wireless. "There's 50 years worth of knowledge, know-how and continuous improvement that's created something like the 800 Series," said Taylor. "And those exact same people worked on the Zeppelin. This isn't a side project." The new Bowers and Wilkins Zeppelin Wireless is available now for $699 / £499. Considering Naim Audio's Mu-So wireless streaming system is out there for some $1,500 / £900 it's going to be a very interesting comparison. Check out our hands-on review of the Zeppelin Wireless.